Announced at the UN Climate Summit in New York in 2014, the Compact of States and Regions is supported by the UN and is a partnership between The Climate Group, CDP, R20 and nrg4SD. ICLEI is one of the supporting partners and provider of the carbonn® Climate Registry (cCR), an officially recognized reporting platform for this Compact. The Compact of States and Regions supports global climate negotiations by providing a clear and accurate picture of sub-national government contributions through reliable and publically available data. Each year the Compact will aggregate data to showcase overall GHG reduction contributions made by sub-national governments around the world as well as assess their progress toward those commitments through GHG inventory data. The Compact partners’ believe all state and regional governments – considering their different capabilities and circumstances – should measure GHG emissions and set ambitious reduction goals, because these are the pillars of a robust climate strategy. By acting locally, the Compact proves that state and regional governments are global climate leaders. And this action is increasingly being recognized, particularly following the launch of the UNFCCC NAZCA platform (Non-state Actor Zone for Climate Action) at COP20 in Lima – which the Compact will supply data to. 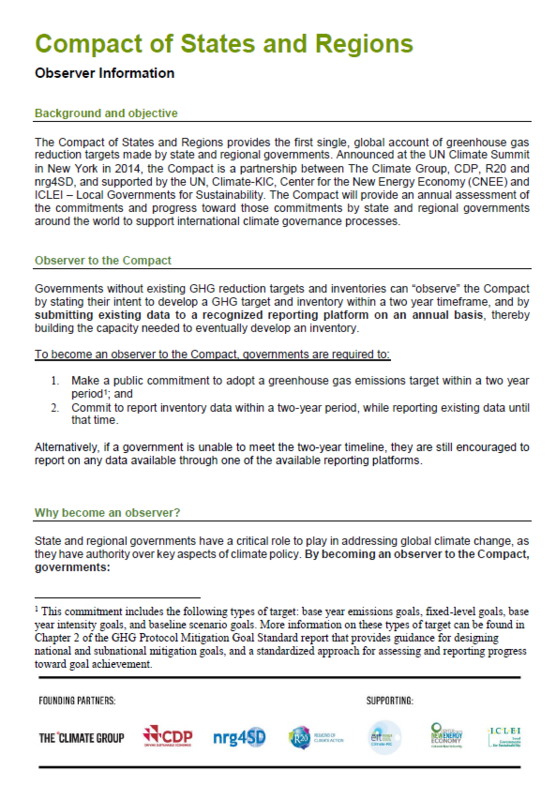 publicly reporting a standard set of greenhouse gas inventory data to Compact partners on an annual basis. committing to report inventory data within two years, while reporting existing data until that time. The first Compact of States and Regions disclosure report will be released at the 21st Conference of Parties to the UNFCCCC (COP21) in Paris, December 2015. The carbonn® Climate Registry (cCR) is a recognized reporting platform for local governments joining or observing the Compact of States and Regions. Data reported to the cCR as part of the Compact of States and Regions will be aggregated in the CDP states and regions platform (the other recognized reporting platform). The cCR is open for voluntary reporting to all levels of governments, from towns and cities to states, regions and provinces. The cCR has been designed to support and facilitate vertical integration, encouraging local governments within the same geographic region to report, also ensuring that data is not double-counted when aggregated. The cCR is managed by the Bonn Center for Local Climate Action and Reporting (carbonn® Center) based in Bonn, Germany, hosted by the ICLEI World Secretariat. See the latest status of committed and observer States and Regions!